Thank you all for allowing us to peak into your lunch boxes, bentos and plates. It really was exciting to see how each one of you packed your lunches, what ingredients you used and of course what boxes you all use! The best thing of all was seeing so many of you packing not only scrumptious lunches, but healthy ones. Good for you! If you should ever run out of ideas though, just come on over to this page for brilliant inspiration! Before we do get into the actual roundup, we would like to share some great news with you. You might have noticed that badge in the sidebar under "Blogger Choice Awards." Well one of you went and nominated us for "Best Parenting Blog" and now many are already voting for us. We really would like to thank you for your awesome support and loyalty. We girls love writing for the Daily Tiffin and hope you enjoy what we are doing here. If you do and would like to take a few minutes to vote for us it would rub our egos in the right direction ;-) To vote simply click here. 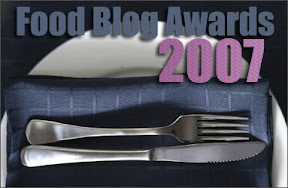 Best Food Blog - What's For Lunch Honey? Best Photography Blog - What's For Lunch Honey? "A SIMPLE BUT NUTRITIOUS TIFFIN which has rice, prawns, peas, and carrots so all the components of a healthy meal are taken care of." "I needed a good, balanced lunch box for my 8 year old but also needed something that would be quick to put together so I could send him off to school and go back to bed. Enter the goat cheese and the 4 minute lunch box: fresh strawberries, little goat cheese "sandwiches" made with whole wheat paris toasts, slices of black forest ham, cucumber coins, a thermos of strawberry yogurt, and for dessert, raspberry linzer cookies (with a few of the little cut outs for fun.)" "I pack one for myself every day! Or every night, I should say, so I can throw it in the fridge and not have to deal with it in the morning"
"This is lunch for my almost four year old at preschool. She is usually helping in the packing process. She's a light eater, and I'm sure at least 1/2 of this will come home. Salad with Ranch Dressing -- she calls it fresh dipping for some unknown reason. 2 Welsh cakes... perfect for the lunch box as they travel well." "At this point, follow my instructions very carefully: with a steady hand and your widest spatula under one corner of the frittata, scoop it out onto a dinner plate. Then, invert the frying pan on top of the frittata, hold the pan handle and the bottom of the plate really securely, think inspiring thoughts, believe in yourself (I think I can, I think I can…) and flip*. Now cook the frittata for another 2-3 minutes or until you feel with your finger that the center is firm." "I also know I am a snacker, and I make sure I put enough nibbles in my lunch to ensure a trip to the vending machine is promptly foiled." "The above meal is my first demonstration of the art of eating and cooking efficiently. Only the raviolis and radish leaves (Yes, cooked radish leaves, I’ll elaborate in a second) are cooked for this lunch, rest is leftovers and stash. The zucchini is leftovers from my morning omelette, and the chicken pieces are from the freezer. Orange wedges are from lunch, I just couldn’t finish them after greasy Chinese." "had leftover sancocho (Latin American stew that I made with beef, tripe, potatoes, yucca and malanga -- like taro) from the night before, so when cleaning up after dinner I packed up my stew in a thermal lunch jar, chopped up Bug's stew and put it in a microwave-safe dish, and popped both into the refrigerator overnight"
"A pick-me-up bento for tomorrow, with pretty colors and healthy veg and rice!" "It is the Indian Tradition of having the sumptuous nutritious meal,after the SURYODAYAM,or the sunrise.This should be taken after the sun has risen well enough in the horizon...the time roughly between 10.30am-12.00noon.After the British rule,Indians stuck on to the habit of breakfast.They called this morning lunch as BRUNCH...but whatever.. my family still follows this method of HOT Brunch,a well balanced and nutritious array of vegetarian delights." "Being Indian, I have a tonne of tupperware lying around so I used a nice flat rectangular box as the base and filled it up with a few smaller boxes, and juice containers. My m-in-law had recommended I make rotis, but I decided that something hot in a thermos might be good after such a long trip. The bento boxes really remind me of how they serve the food to you on the airplanes, so I guess the theme was quite apropos." "My lunch box is easy to pack, anything that will keep me from eating out is welcome in my lunch box. But the toughest (is that a real word? no time to look in the dictionary) is to pack a kiddie friendly lunch box, especially for someone like my daughter for who the process of eating rice is an arduous task by itself ,time consuming requiring constant prodding." Middle, from L-->R: carrot, celery, corn, ham, cabbage. Veggies were braised in chicken stock. Bottom: onigiri with umeboshi/katsubushi (bonito flake)/soy sauce filling"
"or a long time, pasta has been the second staple item in our family besides rice. From simpe to complicated dish, pasta equals comfort." "I have to admit that I am a "Mittagesser" a luncher at midday. So are the remaining members of my family, the three gentlemen. Two of them have lunch away from home, my firstborn at school and the BevA - the best husband of all - in a very good canteen at work. So I cook on weekdays for son no. 2 and me a healthy lunch." "Here I have attached a simple but happy lunch I packed for my husband & myself one day in this week. We usually eat rice for lunch along with some vegetables & fruits and for dinner it’s strictly Tiffin, like Idly, Dosa, upma..you name it + fruits. But lately (as I have become a bit health conscious) and I started including either a small box of salad or couple of Chappathis/Rotis and I had reduced the rice amount! Following in this pattern, this lunch I packed for us got, A small box of Ridgegourd dal rice, 2 Rotis, Rajma curry to go with the rotis and some cut fruits (Honeydew & Grapes). Hope this is what you wanted from us to take part in this event. Am not sure whether you need me to send in the recipes for this. Please let me know, if you need anything else from me." 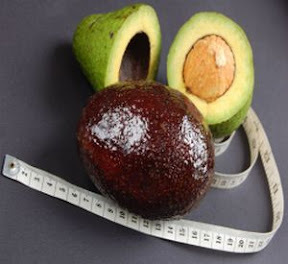 "Used the 4:3:2:1 ratio of Japanese Bento method with Dhokla, roasted Veggies (baby potatoes, green peas and carrots), Fruits (strawberry and grapes), and I replaced Dessert with dried fruits Walnuts and Cranberries." "a bagel(a kind of thick bread) with flavored cream cheese and some strawberries and grapes. A box of chocolate milk and some string cheese for a snack and lunch is ready. My son still prefers this to buying from the school and even helps me make it on a harried day. The cream cheese varies in flavor as per our moods..sweet to spicy to sour." "Dabba in many Indian languages means a 'box'. 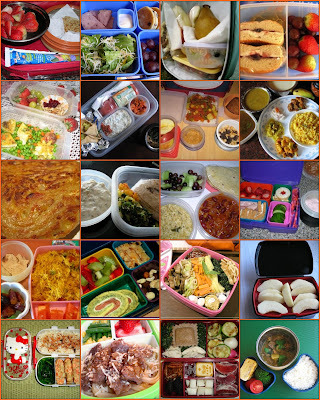 In India, the word dabba is easily synonymous with a lunch box as in 'Aaj dabbe mein kya hai?' ('What's in your lunch box today' in Hindi)"
"My mum constantly sends me packets of cashews, almonds and raisins from Dubai as she knows how much we enjoy them. Here I have made a little dried fruit and nut mix with a few cashews, almonds, raisins, hazelnuts and dried cherries. My mother calls this "brain food."" Thank you all for contributing to this event. Hope you enjoyed it just as much as we did. The theme to the next event will be announced on Wednesday so come back then folks. If you like what we girls do here and would like to vote for us, click here. Thanks for your support! This is great! It is so interesting to see what we bring to lunch. I tend to think we are lunch bringers, or lunch eater-outers and there are few in between. But, I could be wrong. Thanks for putting this together! i finally had a time to check the round-up, a great one! thanks!